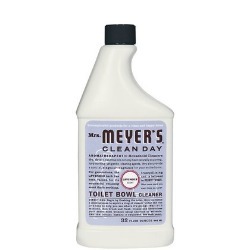 Elaine has shared her Mrs. Meyer's Clean Day toilet bowl cleaner review. (1) I feel everyone should do what they can to protect the environment--it's the ONLY environment we have, after all and (2) I prefer green products because they are non-toxic and healthier for me, my family, my two cats and my dog. I have mild arthritis in my hands that makes it difficult to do any hard scrubbing. I live in a rented apartment in a very old building and my bathroom fixtures are pretty old, and so hard to keep clean. My toilet bowl had been especially difficult to keep clean. I had tried several eco-friendly toilet bowl cleaners, and they smelled nice and I knew they were environmentally safe--but they required me to do a lot of scrubbing with them, even when I let them sort of "soak" on the toilet bowl for a while. I tried Mrs. Meyers. I have used other Mrs. Meyers products and been very happy with them. I had not initially thought of trying the toilet bowl cleaner because all her products seem so mild and gentle--I just didn't think her toilet bowl cleaner would be "tough" enough for my situation. Of course, I loved the lavender scent. And I was amazed that it made the toilet bowl sparkle--and all I did was apply it and WAIT--about 10 minutes later the stains were gone. even took out some of the deep seated stains that I thought were there for good. I just swished a toilet brush around once or twice--no scrubbing at all. I don't see any negatives in this cleaner--it's just great. Thanks Elaine for your Mrs. Meyer's toilet bowl cleaner review. Typically toilet cleaners can be some of the most caustic and strong chemicals you have in your home, so it is great when you can find something that works well, but is still safer for your home and the environment. Has anyone else used this toilet bowl cleaner and have a similar (or dissimilar) experience? I would love for you to share your toilet cleaner review here, for this or any other brand, sharing what you liked, or didn't about it, and why. You can also read other reviews that have already been submitted. Further, I've collected many natural bathroom and toilet cleaner reviews here that you can check out if you too, like to use eco-friendly products in this room of your home (or share your own review as well!). Finally, you can share your Mrs. Meyer's Clean Day cleaning and laundry supply review here, if you've used any of these products in your home, or read other reviews already submitted. Earth Friendly Cleaning Products - Which Brands Work Best? Join in and write your own page! It's easy to do. How? Simply click here to return to Mrs. Meyers cleaning products.